This is a healthy evening snack.The preparation takes less time.Take care while cooking the whole green moong otherwise it will be overcooked and the sundal won't taste good. 1. Soak whole green moong over night. 3. Heat oil in a pan. Splutter mustard. Add red chilly, asafoetida and curry leaves. 4. Add cooked moong. Stir once. 5. After 2 or 3 minutes, switch off the stove. Add coconut. 6. Serve hot with a cup of coffee or tea. 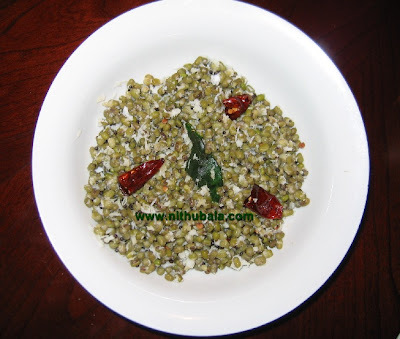 Moong sprouts can also be used. Remembering my mom...she used to make it in a same way...atleast twice ina week..yummy .Join me in Fast Food Event - Pasta and Know your Sweetness - Honey in my blog. this used to me my breakfast when i was in college... a healthy replacement for the usual indian breakfast. very yummy and healthy sundal.